Recent data from the National Association of Realtors showed existing home sales rose sharply in October over September. Good enough. But home sales and home prices are different matters, whether you’re talking about the U.S. as a whole or the local real estate market here in Coral Gables and Miami. Most people are more concerned about home values, not sales volumes. The NAR data show that prices have fallen for five straight months since June 2009 on both a median and average basis. Does this mean prices have yet to hit bottom? Not necessarily. There is a seasonality to home prices. NAR monthly price data going back to 1999 show that a high point is usually reached in June, sometimes July, and then prices slide until about October. We might have seen the low on a nationwide basis earlier this year, and the current seasonal trough may put in the “higher low” that will help confirm that. Home prices in the Coral Gables and Miami real estate markets might have seen their lows earlier this year as well. But that’s a subject for a different post. After plumbing new depths of decline last week, mortgage applications for home purchases bounced smartly this week. These are national numbers, not specific to real estate in Miami or Coral Gables. The S&P Case Shiller home price index for September 2009 was released today, and shows that prices gained slightly in Miami, up 0.5% (or 0.6% seasonally adjusted) from the month of August. This comes on the heels of a 1.1% gain in August. Miami home prices have risen for several months now, according to this index. Real estate prices in Miami are still lower than a year ago, but the year-over-year decline is shrinking. Month-to-month gains show up sooner than, and eventually would turn into, year-over-year gains. Whether the trend will continue is the question. In Miami as elsewhere, the Case-Shiller index shows a smaller gain for September than for August. A number of cities slid back to declines in September after gains in August. Miami home prices have enjoyed decent gains for a few months, but doubt remains about whether prices have turned the corner for good. Government handouts for home buyers may have helped stabilize real estate prices, raising questions about the true health of the underlying market. And of course, other measures such as price-income ratios and buy-rent comparisons still make the idea of buying residential real estate in Miami a challenge for any rational mind. Note that the Case Shiller index tracks same-home sales, which usually lessens errors that can be introduced by changes in the mix of homes sold. But in these extraordinary times, when a very large proportion of Miami real estate sales consists of foreclosures and other distressed sales, price action in that segment of the market takes on outsized significance. Existing home sales for the month of October reached an annualized rate of 6.1 million units, says the National Association of Realtors. That’s up almost 25% from the pace in October 2008. Equally important, the inventory of homes for sale declined to 7 months, down very sharply from 8 months’ supply in September. At that rate of change, there wouldn’t be any homes for sale soon. The data support the case for a nascent housing recovery. But look before you leap. October’s data got a boost from the November expiration of the $8,000 homebuyer tax credit. Some 30% of sales are distressed sales like foreclosures. And the 6.1 million pace is getting back toward the 7 million or so that we reached at the peak in 2007, which marked the end of the biggest, phoniest real estate bubble in American history. The $8,000 homebuyer tax credit was recently extended (and expanded), but only after urgent advertising convinced some people to Buy Buy Buy before the originally scheduled expiration. 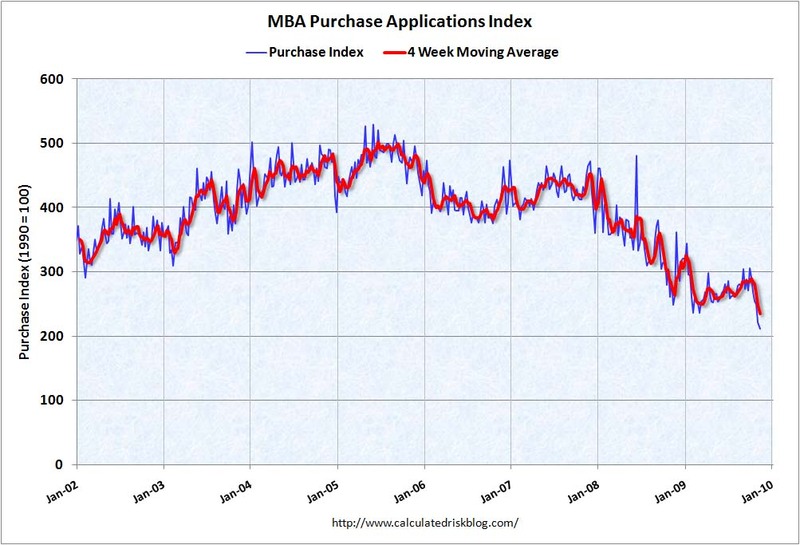 As a result, purchases have dried up in the last few weeks, as evidenced by the Mortgage Bankers Association’s Purchase Index, which measures the number of mortgage applications being submitted. The index has declined for six straight weeks and is at a 12-year low. Calculated Risk has a nice chart. National housing starts data were released on Wednesday and it wasn’t pretty. Economists expected 600,000 starts, but the figure turned out to be 529,000. That’s a big miss by any measure, but it’s especially significant because it created doubt about the perceived housing recovery. At best, the homebuilding sector is bouncing along the bottom. At worst, it’s still in a downtrend. Time will tell. These are national figures and do not dictate the direction of the real estate market in Coral Gables or Miami. But it would be foolhardy to think that South Florida — poster-child for the real estate boom and bust — will not track the national data in this cycle. Be careful out there. Ignorance is risk. As noted previously, luxury real estate in Miami and Coral Gables has been stuck in a supply-sales imbalance. Too many houses on the market relative to sales usually means falling prices. Even if distressed sales are less likely in the luxury home market as in the lower-priced segments of the market, people still feel the need to move on with their lives. Nobody’s getting any younger. And while the wealthy have more staying power, they also have more going power — i.e., they can accept a lower offer just to move on. High-priced real estate is not perfectly independent of lower-priced real estate. Most people in luxury homes started with less and moved up. Paul McCulley of PIMCO has explained the “Plankton Theory” of his colleague, bond king Bill Gross: The real estate market is like a food chain, and those at the top will starve if those at the bottom die off. You cannot eliminate a portion of the population of buyers without affecting home values. “Well-contained” has become an adjective of ill repute. High-end real estate is not independent of credit markets. Although many luxury-home buyers pay cash, many borrow against income and pay a mortgage. Not all are “liquid” like Gordon Gekko. Changes in credit availability and changes in perceived income and job security affect the ability and willingness of some high-end buyers to commit. Again, you cannot eliminate a portion of the population of buyers without affecting home values. These are extraordinary times born of extraordinary excess. The Federal Reserve, the U.S. Treasury and Congress have taken actions that are consistent only with a belief that the nation faces the threat of a debt-destroying deflationary depression. It’s enough to give even a rich man the willies. The least one can do is avoid overpaying for a depreciating asset with borrowed money. Although luxury home prices in Miami and Coral Gables did not fall like the rest of the market over the past couple of years, that has to some extent been a function of the stalemate in sales. As sales activity thaws, prices should reveal themselves to be significantly lower. The home at 8400 SW 52 Avenue (a.k.a. Schoolhouse Road) in the Ponce/Davis neighborhood of Coral Gables sold in November 2009 for $2.3 million. That’s barely more than the $2.25 million that the seller paid for the property in 1999. Not that the seller, Charles Stiefel, was in financial straits. He sold his company,Stiefel Laboratories, to Glaxo SmithKline for $2.9 billion in July 2009. Sellers at the high end may have more staying power — but they also have more going power!